Poor Picasso. 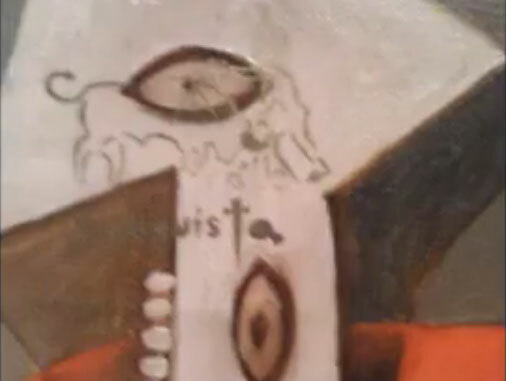 His “Femme au fauteuil rouge (Woman in a Red Armchair)” (1929) was vandalized last week at Houston’s Menil Collection and the artist claiming responsibility for the action, Uriel Llanderos, has essentially been bragging about his bravado on his rather sparse Facebook page. A photo of Uriel Llanderos from his Facebook page. “Young Mexican-American artist URIEL LANDEROS, paints a stencil of a bullfighter killing a bull over an original 1929 Picasso painting in Houston TX. What did the letter say? Something is obviously fishy in this story. No one has been charged in the Picasso incident at the Menil Collection, which is strange in and of itself. CultureMap does report today that an email circulated among faculty and staff at the University of Houston on Monday that a student from the university has been linked to the crime, but nothing has been made public. Editorial note: The original video that was posted soon after the incident (and previously found here) has since been removed from YouTube (and the account that posted the video has been closed) but the video remains online and we’ve replaced the video at the beginning of this post with another copy.